The Brooklyn DA’s office is investigating allegations that the two teens beaten to a pulp by an enraged boyfriend outside a Brooklyn Mosque were sexually assaulting his girlfriend, The Post has learned. The probe was launched after the unnamed woman claimed that the teens were taunting and molesting her when her boyfriend, Christopher Vallaro, ran to her rescue. But investigators with the DA’s office have scheduled a meeting with Vallaro and his girlfriend to look into the accusations that the teens reached through the car window and groped her breasts and body, sources said . Vallaro came to her rescue when he heard her screaming for help from floors above in his apartment, which is located adjacent to the Sunset Park mosque. 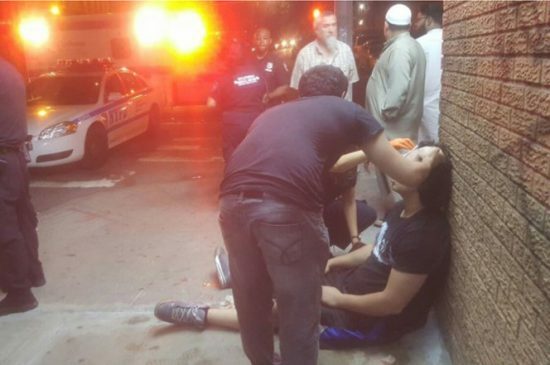 The July 2 beating was originally investigated as a hate-crime, but police later concluded the teens’ Muslim faith was not a motivating factor.